There's more than one way to feel the flab. 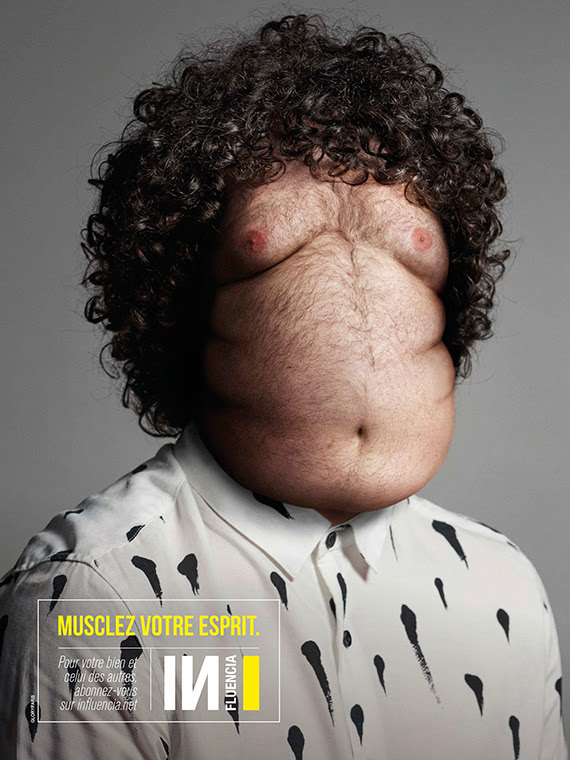 But however much time you spend on the treadmill, French ad publication Influencia hopes to draw your attention to a more insidious fitness foe you may be overlooking—infobesity. 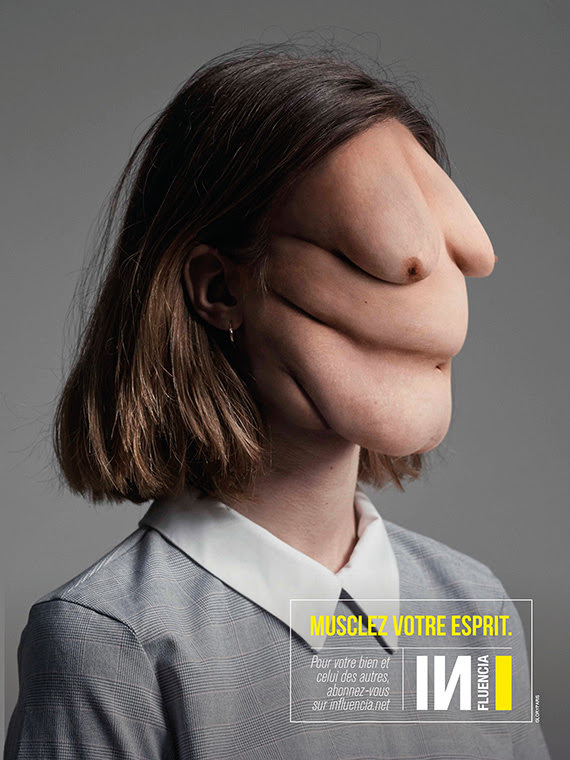 It's getting the conversation started with a surreal campaign from Glory Paris. "We consume information without verifying it, because it's more important to talk about it than to check whether it's true," say Glory Paris founders Arnaud Lebacquer and Hugues Pinguet (yes, in unison). They go on to add, "We've become info-bulimic. We ingest it, and if we aren't satisfied, we look for more opportunities to do it—on the subway, or at night before bed." 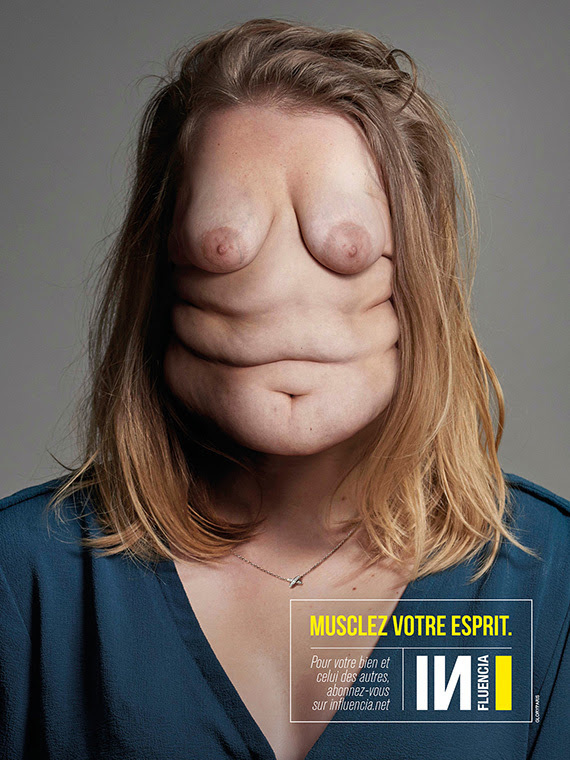 The campaign, dubbed "Musclez votre esprit"—roughly translated "Muscle up your mind"—features portraits of people with flabby breasts and bellies for faces. Influencia calls this an "homage to Magritte," the surrealist artist. Each print ad includes a call-to-action: "For your well-being and that of others, subscribe to influencia.net." Communications professionals and prolific info-consumers are most in danger of infobesity, Influencia says in an accompanying press release. "We've entered a world of media overconsumption. Public demand, sharing, immediacy and overall urgency prevents us from investing quality work with necessary reflection." In other words, infobesity is the greatest enemy to creativity today. We can roll with "infobesity" being a problem, having had our fair share of breakups and makeups with Facebook. In a previous generation, people used to sit down for the news, mentally preparing for what was to come; today "news" attacks us at all hours, on autoplay between baby pictures and wedding montages in a never-ending newsfeed. There is always more stuff out there than we can consume. But the fact that we can consume it anytime makes us feel responsible for what we don't know. So while it's easy to scoff at new ideas like internet PTSD, it also strikes us as a natural response to the pressure we now systematically impose on ourselves and others. Then there's the question of whether this particular treatment of the subject feels appropriate. While we'd be hard-pressed to think of gentle illustrations for a notion as provocative as "info-bulimia," the work can also be seen as fat-shaming. "In observing our dangerous consumption of data, it seemed logical to show it symbolically," say Lebacquer and Pinguet. "We primarily wanted to cultivate awareness of the garbage we put in our bodies—and the brain, of course, is part of the body. The work is risky … but it's also a reflection of who we are." Glory Paris is no stranger to eyebrow-raising work. The startup agency launched last year, and its first client was itself. In January 2015, it revealed its business cards: One side was normal; the other side was the business card of a famous person whose contact details you wish you had, like Mark Zuckerberg or Larry Page. 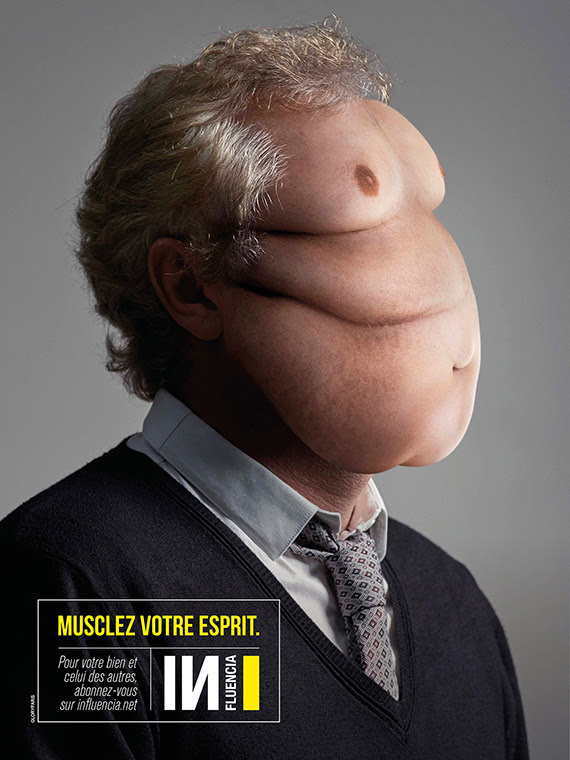 Nine months later, it released a print ad that featured a "letter of motivation" from Maurice Lévy. So for them, it's safe to say the end justifies the means. "Let's be selective, and stop filling our brains with informational sugar and fat," they conclude.